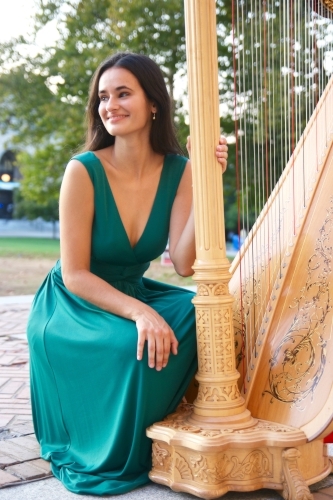 Mia Venezia is a senior harp performance major at Carnegie Mellon University. She has been playing the harp for 15 years and is currently studying with Gretchen Van Hoesen. Aside from playing regularly with the CMU Philharmonic Orchestra, CMU Contemporary Ensemble, and CMU Wind Ensemble, she is a member of the Tartan trio and CMU harp duo. She has also played with the Pittsburgh Symphony Orchestra, The Chamber Orchestra of Pittsburgh, Lansdale Symphony Orchestra and at the Philadelphia Symphony Orchestraâ€™s Atlantic Coast Opera Festival. Ms. Venezia has been a first place winner for the Pittsburgh Concert Society Major Auditions and Tri-County Youth Festivalâ€™s solo and chamber divisions as well as finalist for both the ASTA Strings Competition and Anne Adams Awards. She has received several scholarship awards, such as the Tuesday Musical Club Scholarship, CMU Archer Award, and Pittsburgh Concert Society Grant. Mia also enjoys giving back to the community using her talent to provide music therapy at local hospitals by her home in Jeffersonville, PA.